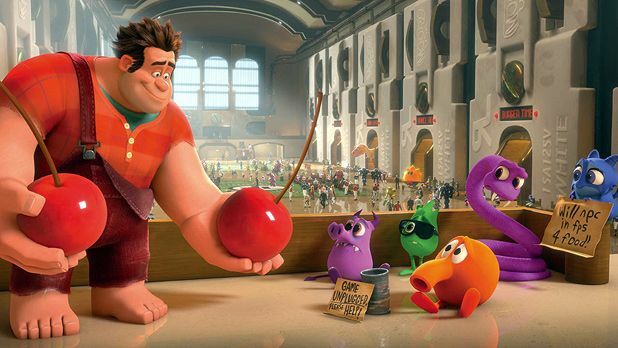 Number one with a bullet on its recent American release, this cleverly-targeted family romp marks a step up both commercially and artistically for the non-Pixar side of Disney’s animation offering. Indeed, on a script level it’s substantially superior to Pixar’s last outing, Brave. The eponymous Ralph, winningly voiced by John C Reilly, is the baddie in a creaky Super Mario-style arcade game (and therein lies some of the cleverness: as was the trick with Toy Story in its day, kids can enjoy the up-to-the-minute animation and cute new characters while parents thrill to the nostalgic references to old-school childhood obsessions). At the end of the working day the arcade characters clock off and hang out, but Ralph, as a baddie, is persona non grata. A support group for bad guys - while delightfully funny for us - doesn’t rid him of his yen to be a hero, and soon he’s broken out of his own game to find recognition elsewhere. He thus encounters the extremely scary soldier Calhoun (Jane Lynch), from Hero’s Duty (whose scowling intensity is ‘not her fault – she was programmed with the most tragic backstory ever’), and cute but glitchy Sugar Rush race contestant Vanellope (Sarah Silverman), and pulls both into his adventure. The film spends a touch too long in the toothachey world of Sugar Rush; it would have been fun to have seen more of other game environments, but maybe that’s being saved for sequels. And parents might wish to consider that the film pushes sweeties and bleepy video games pretty damn hard, though product placement is relatively discreet, and certainly no more aggressive than in Toy Story. But the script is brilliantly witty; the visuals sweep, swoop and sparkle; and the message about flawed individuals finding their own way to be heroes is a kindly one, intelligently expressed.